Jigger, Shaker Classic/Boston, Citrus Juicer, Strainer, Tablespoons, Martini Glass. Fill a cocktail Shaker halfway with ice. Add Vodkas, Raspberry Liqueur, Lime Juice, Simple Syrup, and Cranberry juice. Shake or stir until well chilled. Strain into a Martini Glass. 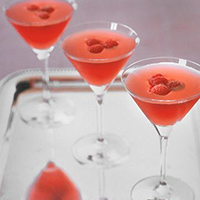 Garnish with Raspberries; serve.